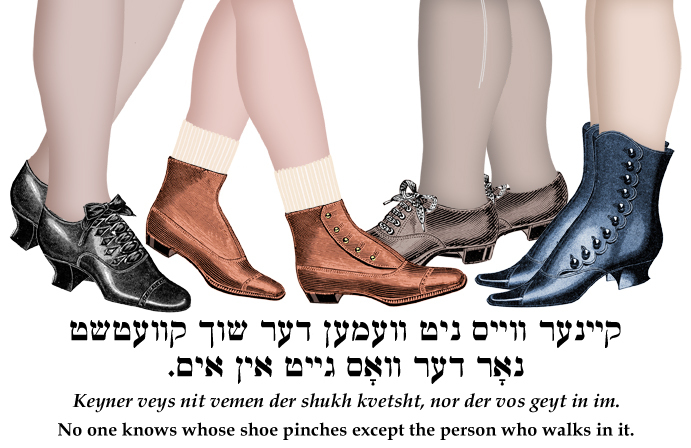 Yiddish Wit: No one knows whose shoe pinches except the person who walks in it. קיינער ווייס ניט וועמען דער שוך קוועטשט, נאָר דער וואָס גייט אין אים. Keyner veys nit vemen der shukh kvetsht, nor der vos geyt in im. No one knows whose shoe pinches except the person who walks in it. Oyb men vil fargesn di tsores, zol men onton an engn shukh. If you want to forget your troubles, put on a tight shoe.